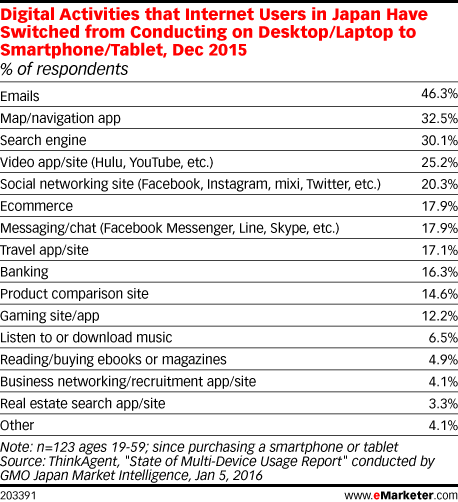 Data is from the January 2016 ThinkAgent "State of Multi-Device Usage Report" conducted by GMO Japan Market Intelligence. 550 internet users ages 19-59 in Japan were surveyed online during December 15-16, 2015. Respondents identified themselves as male (52.9%) and female (47.1%) ages less than 19 (0.4%), 20-24 (2.4%), 25-29 (6.5%), 30-34 (8.5%), 35-39 (15.5%), 40-44 (16.5%), 45-49 (15.8%), 50-54 (18.9%) and 55-59 (15.5%). All respondents were panel members of GMO Japan Market Intelligence.